Two teams of 10 gather on a field. They’re clad in what appears to be armor: a masked helmet, shoulder pads, padded gloves and uniforms. They wield what looks to be a combination of a tennis racket and hockey stick. For more than 48 minutes, the teams will race up and down the field, make full contact with one another, and throw, catch and shoot a rubber ball. This is known as lacrosse—a sport combining elements of hockey, tennis and soccer. While being the oldest sport in the United States, lacrosse is not well known in DeKalb County. However, that hasn’t stopped two DeKalb County School District (DCSD) high school teachers from attempting to sow the seeds of the sport through elementary age recruitment. Martin Luther King, Jr. High School teachers Corey Carter and Ramon Rivers have been coaching boys’ and girls’ lacrosse at the high school level for more than seven years. The two teachers view the sport—like any other athletic and extracurricular activities—as a vehicle for success, college scholarships and student growth. Boys’ head coach Carter, a Career Technical Instructor and DCSD educator for 25 years, said he started the sport at MLK seven years ago to provide more opportunities to students. He brought in Rivers, girls’ head coach and the school’s math department head, to broaden all student horizons. Carter said lacrosse fulfills the needs of students who are athletic, but simply do not wish to participate in the school’s main sports of football, baseball, basketball and track. He said the team is typically comprised of students who don’t want to play traditional sports but maintain their athleticism. Three-year varsity girls team member and junior Erikka Crawford said she joined lacrosse because she appreciated how different it is. She said Martin Luther King, Jr.’s overall program is growing, as evidenced by the varsity girls’ team having their first winning season in 2016-2017. Crawford said she plans to play lacrosse during her senior year and attract the attention of colleges and universities. After high school, she plans to continue showcasing her talents both on the field and in the classroom. 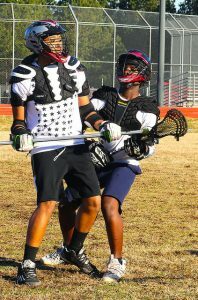 Four-year team member and senior Daniel Washington said he first saw people playing lacrosse on television. He said he appreciates how much physicality is involved in the sport, which involves running, near-tackles, and quick thinking. Washington said he hopes to play lacrosse in college no matter which school he attends, but he has his sights set high. Carter and Rivers attribute the lack of lacrosse in DeKalb County—where only six district schools offer the sport—with a lack of exposure at an early age. In the south DeKalb area, the sport is only offered at MLK High and Southwest DeKalb. “There’s a huge need in this area for non-traditional sports like tennis, golf, lacrosse and swimming that are played at Ivy League schools,” Rivers said. 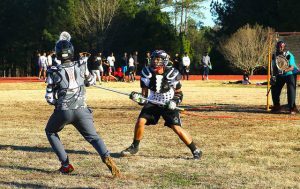 Carter and Rivers are in the process of developing Urban Lacrosse Atlanta, a nonprofit lacrosse program geared toward elementary and middle school aged children. The long term goal of the organization is to foster skills at an early age and develop a bonafide feeder program for DeKalb high schools. Carter and Rivers said Urban Lacrosse Atlanta will coach and compete with youth as young as five or six years old. The duo wishes to install skills needed to compete at a higher level, and potentially provide a pathway to D1 and D2 college scholarships. If the program is successful, Carter and Rivers hope to cultivate more than 3,000 participants who will play against one another and travel to other leagues for competition. The duo is already surveying practice and playing sites in Atlanta, Lithonia and southern Fulton County. Free clinics will begin in Summer 2018 with hopes to have a league established by January 2019. Once elementary age students begin playing lacrosse, Carter and Rivers believe the desire will last until high school and create a demand in local, public systems. Carter and Rivers believe the program will fulfill a need in the metro Atlanta region, as they believe the metro area has the best athletes in the entire country. The vehicles to harness such talent and put it into more than just football, baseball, basketball or track, however, are lacking. See this story in the Spring 2018 issue of We are DCSD Magazine.